Storytelling works its way into every family, whether you realize it or not! It’s sitting around the dinner table and asking each other, “How was your day?” It’s remembering holidays and vacations together while you page through a photo album; it’s telling an embarrassing story that you are now able to laugh about. Over Memorial Day weekend, I was stung by a wasp, and my youngest daughter Emmy was there. She asks me over and over again, “Tell me when you got stinged by a wasp!” Babies love to hear their mothers’ voices; storytelling begins before they are even born. When I was pregnant with Lily, I talked to her constantly; while I was pregnant with Emmy, she heard me talking to Lily constantly! Janna of Mommy’s Piggy Tales began a project to share our youth with our children. Every Thursday, I will tell a story about my childhood as if I were sharing it with my children. At the end of this project, I’ll have a collection of stories about my childhood for my children to keep, and hopefully treasure. It was the middle of the night, in the middle of winter, in the middle of the country. The nearest hospital was 40 miles away, and my parents, your Grandpa Jim and Grandma Loreeta, had to drive across the border — the border between Nebraska and Iowa. It was a very snowy night, but Grandma and Grandpa arrived safely — and on time — at the hospital. Back then, the father of the baby was not allowed to be present during the birth, so Grandpa had to wait in the waiting room. Grandma delivered me so fast that the doctor told her, “What do you think you’re doing? Having a baby?” I was born on Sunday, February 2, at 3:39 a.m.
Grandma asked, “Is it really a girl?” when I was born. And when Grandpa saw me, he was speechless. Not only is February 2nd Groundhog’s Day, but I was also the first baby born in Sioux City during National Dental Health Week. Grandma was presented with a silver baby toothbrush by the president of the local Dental Auxiliary. 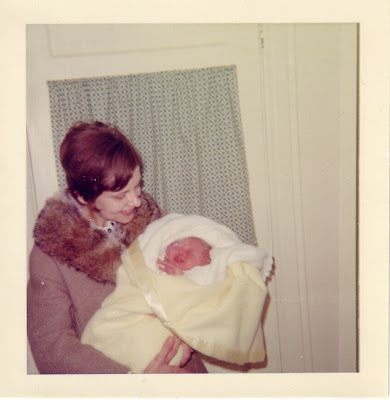 There was a even a photo of the presentation and an short article in the local paper about my birth. When I was born, Grandpa was the pastor at a small church in rural Nebraska. Grandma and Grandpa wanted to give me a special name, and so they gave me a first name that meant I was a follower of Christ. My middle name is my mom’s middle name, and my grandma’s middle name, and my great-grandma’s first name. And that is how Grandma and Grandpa named me: Christa Marie. That picture has made my heart melt! Oh, what a sweet story. And national Dental Health week? Wow, what an honor! 😉 I hope you've remained cavity free since then? What a sweet story. It is so important to share family stories and blogging is the perfect place. I crossed over from Piggy Tales group 1 to visit because I'm a follower of yours, and I love that you wrote your story to your girls! I may have to steal that idea! I've set up a separtate blog to keep my stories organized. It's http://www.animomemoria.blogspot.com if you want to check it out! LOL- my dad is a dentist; he would have loved the silver toothbrush! This is a beautiful story, and such a neat idea to write it down (*type it out) to share with your girls (and us!). I adore how you wrote it as a letter to your girls! How funny about the silver toothbrush! I love quaint details like this! I loved you as Ginny Marie but Christa Maria is just as beautiful. I just felt the story wouldn't be complete or make sense without giving my real name! I love it! You were wondering about sharing your given name. What made you decide to throw it out there? What a neat idea! I love the way your story is directed to your daughters! I will look forward to hearing more! I love that you wrote this story to your daughters! What a sweet way to record your youth! And I love that picture – seems like they always bundled us us tight, right? What a sweet story and picture. I look forward to reading your story as it unfolds. Blessings! I think it's wonderful that your name is a carryover from family members and the picture is wonderful! What a great idea! Your kids are going to treasure these stories. What a great gift for your children, and their children and their children etc. I would treasure something like this from my ancestors if I were lucky enough. I can't wait to keep reading your fun stories. The only thing I know about my birth is that I was born at home (as were both my brother and my sister) and my father was present (for my siblings' births as well). So, how are your teeth nowadays? What a GREAT idea! I need to do this! Last year I made my middle daughter a little photo book about her birth and the first year of her life…..it is one of her favorite "stories" I've been meaning to make one for my youngest but haven't gotten to it yet. I had never thought about telling the kids stories about ME. The toothbrush part kills me (in a good way, haha) it's so quirky and unique, what a great story to tell to your children. Do you still have the toothbrush?